Publication Information: Harmony. 2016. 240 pages. Opening Sentence: "Our noses almost touched the wall." Favorite Quote: "The next parent who Googles 'Is my 2-year-old gifted?' should get a curt response: 'Your 2-year-old is a gift.'" This book is really not what I expected. Ron Fournier is a longtime political journalist. He is faced with a diagnosis of Asperger's for his son Tyler when Tyler is twelve. Mr. Fournier turns his journalist's skills to that diagnosis even while he traverses its emotional impact on his family. The result is this book. The book is anchored by Tyler's interests in presidents and how his parents turn that interests into trips and a time for father and son to bond. I expect this book to be about Tyler and about the emotional journey of this family. It is, and it isn't. Mr. Fournier's journalist skills are apparent in the information contained in the book outside of Tyler's own story. The book in large part is a commentary on society, education, government, and parenting. It repeatedly makes the point of the disservice society does to its children because of its own expectations. It is editorial writing, if you will. Facts, information, and interviews but with a defined opinion and point of view. It does not remain focused on Tyler's diagnosis, but rather a much broader look at parenting and its challenges. For a relatively slim volume, this book covers a lot of ground. The father-son trips that are the cover story of this book don't actually form a major part of the book. They are presented more as descriptive transitions between the chapters of the book. The aspect of this book that is most unexpected is the amount of presidential history included. Tyler's interest is presidential history. The father-son trips are centered around the presidents. Because Mr. Fournier is a political journalistic, he and Tyler even visit with George Bush and Bill Clinton. However, it is unclear whether politics and political description and history needs to be large part of this book. 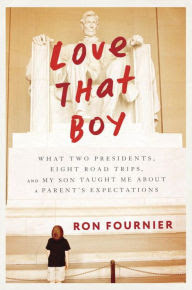 For example, why is a description of a president flirting with Lori Fournier included in a book about parenting? The focus of the writing at times unfortunatley becomes the presidents and not Tyler. Again, For a relatively slim volume, this book covers a lot of ground, sometimes unnecessarily. The book keeps a distance from the emotional side of this journey. I expected to read the family story, but given Mr. Fournier's journalism background, this result is not unexpected. The prevalent emotion that does show through seems to be guilt. Could there have been earlier diagnosis? What impact did the extensive travel required by his career have? How does a father's fear of embarrassment lead to his behavior towards his son? Could have. Should have. These feelings are ones parents experience universally as we all try and do the best for our children. These descriptions are present in the book but more journalistically and analytically than emotionally. The lesson that I walk away with is in the title. "Love that boy" is a father's statement about his son. More than that, "Love that boy" is an imperative for all parents. Love your children completely and absolutely for who they are in all their splendid uniqueness.